ServiceChannel, the market leader in facilities management/contractor collaboration, has received its second Vendor Excellence Award from Nike at their 3rd annual Vendor Conference hosted by the Nike Retail Facilities Team. ServiceChannel provides facilities professionals who are managing multiple locations with a collaborative cloud technology platform where they can source, credential, procure, manage and pay service contractors. Nike invites key vendors to its Vendor Conference to discuss changes, expectations, and to submerge them into the Nike culture. The goal is to build relationships, emphasize a partnership between Nike and the vendors, and encourage an open environment where vendors are welcome to provide input or suggestions to improve processes or identify cost saving opportunities. A select few vendors are presented with the Vendor Excellence Award. With a history in contractor management software, ServiceChannel’s founders saw a need in 1999 to provide retail facilities managers with increased and immediate visibility to facilities service data. ServiceChannel evolved their products to the cloud, initially offering retail and restaurant chains online access to a comprehensive database of service information and performance metrics. 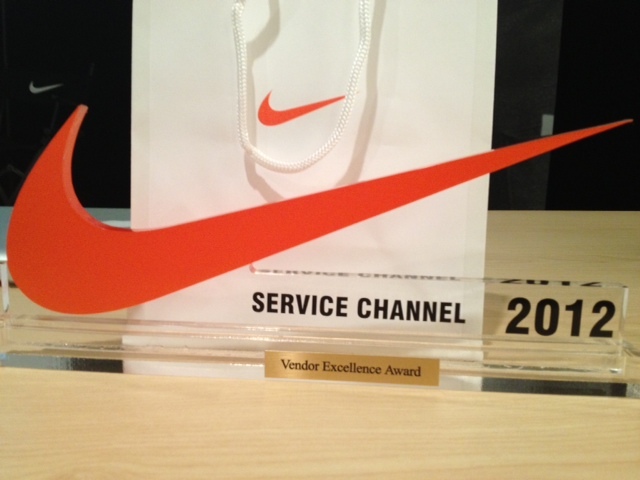 ServiceChannel was awarded their first Vendor Excellence Award from Nike in 2010. The Professional Retail Store Maintenance Association (PRSM) named ServiceChannel as Vendor of the Year in 2011. ServiceChannel provides facility managers with a single platform to source, procure, manage and pay for facility maintenance services from their own network of contractors. By providing a real time, web-based view of service data across all trades, locations and contractors, facility managers drive significant ROI for their organizations without relinquishing control to outsourcers or investing in new infrastructure. More than 30,000 contractors use ServiceChannel every day at over 80,000 locations in over 24 countries.